Home Column How Low Can McLaren Go? How Low Can McLaren Go? We can’t be the only people in the Motorsport world to have wondered many times this season, is this rock bottom for McLaren? F1’s fallen giants, whose last race victory came at the hands of Jenson Button at Interlagos in 2012 were dealt another blow today with the announcement that their long time commercial partner Tag Heuer would depart for rivals Red Bull at the end of the season. Nearly two seasons away from the podium has taken it’s toll on McLaren Honda, and the departure of Tag will only further increase the concern which must be building back in Woking. For a team missing a title sponsor since the end of 2013, the disappearance of another funding source will no doubt give the marketing department at McLaren another headache going into the off season. It was reported in the Telegraph earlier this year that even before the departure of Tag, McLaren were set to lose another £20m in sponsorship, and this coupled with disappointing results in the constructors championships (McLaren’s last constructors Championship was way back in 1998 with Hakkinen and Coulthard at the wheel), even before 2015’s almost certain 9th place finish could spell trouble for one of F1’s most successful teams. The distinct lack of any major sponsorship on both the team’s cars and race overalls is a sad reminder that Motorsport can be a cruel world. And the problems don’t just end there…..
It’s fair to say that Honda, and indeed McLaren have a mountain to climb over the off-season. Whilst not being the most aerodynamically strong car on the grid, it has been very well documented this season that the primary reason for McLaren’s shortfall is the abysmally under-performing Honda engine. Button, Alonso and the McLaren management have made strong promises about improvements in time for 2016, but with Honda already so far behind Mercedes, Ferrari and even Renault, the more astute among us must surely start to realise that it’s unlikely McLaren are going to be challenging at the front of the grid. It would take a minor (or major) miracle to bring the flagging Honda power unit up to Mercedes and Ferrari standards in just 4 months, and with very limited testing. Sunday’s Brazilian Grand Prix was another new low for McLaren, after a better than expected showing in Mexico two weeks ago McLaren were once again relegated to the bottom of the pecking order, ahead of Manor (who incidentally should be much improved next season) and scrapping with Sauber for the title of “best of the rest”. For a team the size of McLaren, and a company the size of Honda, both of which have budgets which dwarf the Swiss team, the embarrassment can surely get no worse? Alonso and Button must have enjoyed their jaunt on the podium after qualifying on Saturday, and we hope they enjoyed it, it could be their only trip up there until 2017. With Button contracted for another season, McLaren would be well advised to make best use of his experience and services in 2016 before his likely retirement at the end of next season before the partnership follows up on their target of challenging the for title in 2017. It’s going to be hard to avoid turning into F1’s also rans…. With the huge budget shortfall McLaren are facing, Superman esque work must be undertaken at Woking to help the team avoid the same fate which has befallen Williams in recent seasons. With undoubtedly a good car, and solid engine Williams find themselves in a no mans land slightly ahead of the midfield, but without the budget and factory backing of Ferrari and Mercedes. 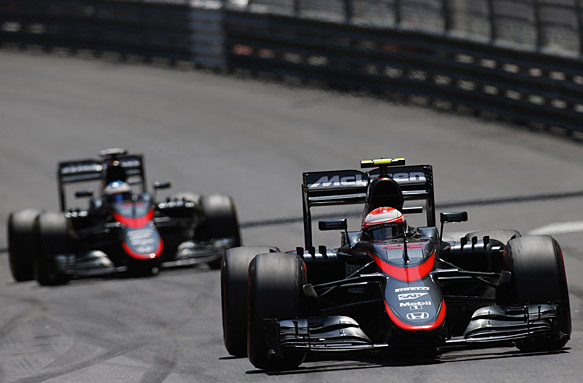 With both of the latter certain to improve their engines over the winter, Honda and McLaren face an even bigger task to close the ever widening gap, a gap which will only become bigger over time as the budget shortfall begins to bite. Whilst it would be fantastic to see Williams back challenging for race wins and titles, without significant investment and primary factory backing such a scenario seems very unlikely indeed. Luckily McLaren have one of those key ingredients, and it happens to be the sole reason they left Mercedes behind in the first place, and it’s now up to everyone in Woking and in Japan to make sure one of F1’s greatest teams isn’t left with egg on its face……..